An investigation carried out by respected media outlets in Italy, France and Germany has obtained one of the tablets used by the UCI for hidden motor checks. 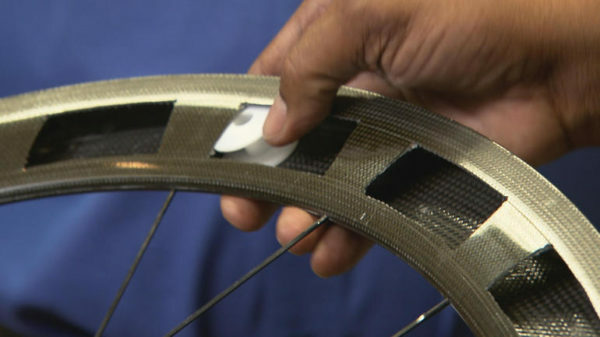 And it says when the tablet was tested it could not find mechanical doping systems hidden in the rims of carbon wheels. An investigation by major media outlets from France, Italy and German claims to show the tablets used by the UCI to check for hidden motors do not fully work. Il Corriere della Sera, France 2 and ARD have conducted the joint investigation. They had one of the UCI tablets used to scan bikes tested in a German laboratory. And in findings for broadcast by the three outlets, the tablet missed some forms of ‘mechanical doping’. The UCI tablet is effectively an Apple iPad which has been modified with software and a magnet added to act as an antenna. One tablet was obtained by the journalists and taken for testing to the Fraunhofer Institute for Nondestructive Testing, Saarbrucken, Germany. The centre’s vice director Bernd Valeske tested the device, according to the media outlets. The UCI tablet was successful in detecting a traditional hidden motor in a sample bike; similar to that found at the World Cyclocross Championships last year. However, in an article published in the Milan-bases newspaper Il Corriere della Sera today, it is stated the device also showed evidence of a hidden motor in parts of the bike where there was none. The device was then used to test a carbon wheel motorised with electromagnetic induction. But the UCI tablet detected nothing. Yet when the wheel was X-rayed, the illegal system hidden inside it was visible. “The wheel is perfectly clean, at least for the tablet,” says the newspaper article written by Marco Bonarrigo. “But the X-rays show the induction plates and the transmission cables, perfectly hidden by carbon,” the story continued. ARD and France 2 are due to broadcast the results of the investigation on their TV channels later today. The UCI has not yet commented on the findings. It began to use the tablets to scan bikes for hidden motors around two years ago.